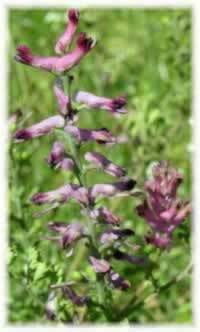 The traditional medical uses of fumitory are as a skin treatment for eczema and other eruptions of the skin. The herb is taken as a tea for indigestion, and can be supportive in treating gallbladder and liver conditions. Preparation Methods & Dosage :Infusions and teas, capsules or extracts. 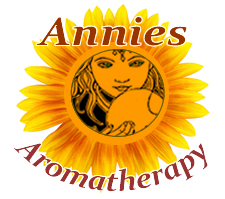 The tea can be used in external skin care as compress for skin problems, or an eye wash for conjunctivitis. Dried fumitory leaves can also be smoked. 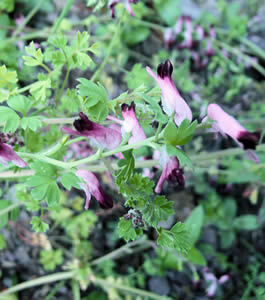 The common name "earth smoke" comes from the smoky appearance of fumitory's whitish flowers when viewed from afar. Fumitory is distant relative of the poppy,and is sometimes classified in the Papaveraceae family and is sometimes placed in its own Fumariaceae plant family.